I had to pop in to town to pick up some staples (bread, milk, etc) from the grocery store yesterday. Inevitably when I go into the store I have to swing by their flower section, just to peruse what’s there, admire the plants, think of what I’d like to buy if I was rolling in cash. In this store it’s right by the front doors, so it’s easy to just park the cart a moment and have a quick walk through. Yesterday they were selling off their Christmas poinsettias, marked down to a mere 99c, from the regular price of $10. I just couldn’t resist picking one up, for that price! I ended up getting three, because I couldn’t decide which one I liked best. And it would only cost me $3, instead of the $30 it might have before Christmas. They’re such lovely plants. And if you take care of them over the summer, and then put them into a strict lighting regimen next fall, they’ll bloom again for the holidays next year. 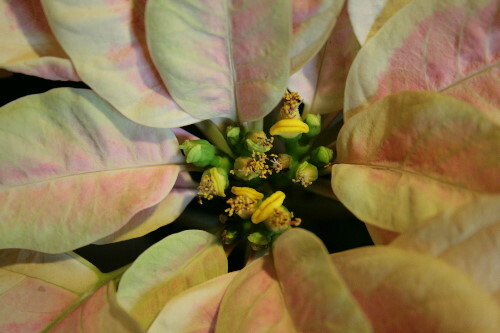 We tend to think of the showy red or yellow displays as the poinsettia flowers, but they’re actually just coloured leaves, usually referred to as bracts, that serve the same purpose as petals in a traditional flower. The actual flower structures are at the centre of all those red leaves, and can be easily seen with a closer look. They don’t look like traditional flowers, either (so we’re excused for thinking the red bracts are the flowers). The bulbous base to each flower is a structure called a cyathium, and is unique to the genus Euphorbia (which includes the poinsettia, E. pulcherima, as well as many smaller and less showy native species). This structure contains both the pollen-bearing stamens and the female pistil. Technically, the male and female parts (one female surrounded by many male) within the cyathium are all considered their own individual flowers, as opposed to parts of a greater whole. It appears that the female flower in the poinsettia cyathium matures later than the males, or at least it didn’t seem to be visible on any of my plants. When it matures, it looks like a ball on a stem, flopped over the side of the cyathium. On my pale plant some of the flowers are still maturing and are still green, so I’ll have to watch how they develop. Is it just me, or do the flowers look like a bunch of baby birds, muppet-style with their big yellow beaks and furry topknots, clustered together and begging for food? The fleshy “beaks” are actually nectar glands that produce the reward for pollinators, since the actual flowers themselves are far too minimalist to be able to accomplish that. 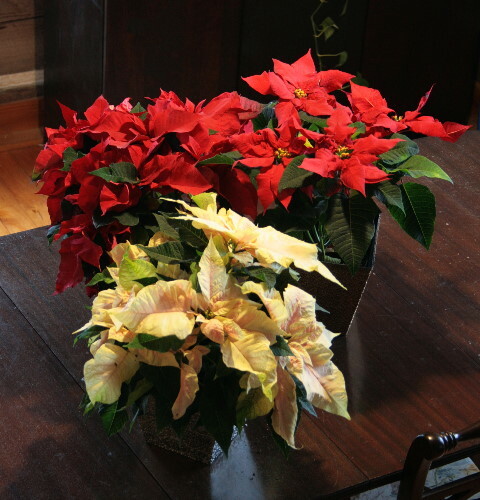 We usually see poinsettias as small bushy plants appropriate for the table-top, but in the wild they are woody shrubs that can actually grow quite large. In the store I saw one potted poinsettia that had been grown for a while longer and its lower branches clipped so it had developed into a tree. It would have made a lovely floor plant, but it was considerably more than the discount 99c plants. 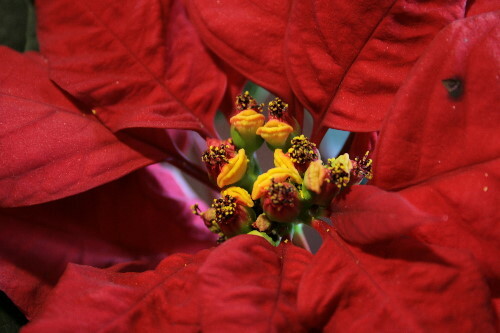 Poinsettias also have an interesting history of use by humans. To learn a bit more about that side of things, visit posts at my mom’s blog, or my aunt’s. Muppet nestlings? Poinsettias just got a whole lot more interesting!